There are six major depositional environments within a Barrier Island system. The areas on the seaward side of barrier island systems are as listed; the shoreface, the foreshore and the backshore. These environments, along with sub-environments are shown in the figure below. We will also discuss the components of the landward side of barrier island systems which include the lagoon, the tidal inlets and tidal deltas. In the figure above the lower shoreface is shown to be the area where the waves start to feel bottom (or a depth of Wavelength/2). This is an area or low energy (in comparison to the rest of the seaward system) so it consists of fine grained sand interspersed with layers of mud. There is intense bioturbation and burrowing in this area. Sediment Geometry: In the lower shoreface the sediment has a gentle seaward slope which is shown in the figure above. Sediment Record: Thin sand and mud laminations may be preserved but it is unlikely due to the intense bioturbation. The middle shoreface is located between the lower shoreface and the foreshore. This area is subject to higher wave energy and as a result has medium to fine grained sands. These sands due to the strong wave interaction are well sorted. The main deposit type in this environment is in longshore bars which are deposited from the longshore current. Sediment Geometry: The middle shoreface is characterized by multi-directional crossbedding. This is due to changing wave direction which changes the direction of the longshore current. Also found in these deposits are troughs which are scoured by the long shore current. Sediment Record: Most of the record is obliterated by the continual reworking of the sediment by the longshore current. Also whole sequences can be erased by storm events. Sediment Geometry: The foreshore is characterized by crossbedding which is perpendicular to shore. Sediment Record: Once again the foreshore is usually obliterated as a result of the constant reworking. The backshore starts from the high water mark and extends to the dunes on the Island. It is in this area that wave processes are less important and eolian processes become the dominant factor controlling deposition. Although during storm events there can be intrusion by the storm surge on barrier island systems. It is at these times that washovers (as explained for the components of a barrier Island system.) Washover deposits are medium to fine grained deposits which are not subject to substantial reworking. Sediment Geometry: The sand deposited in the backshore has multi-directional wind troughs which are caused by changing wind direction. Also during storm events washover fans can develop and are characterized by laminar sheets which are usually thin (< 2m). A schematic of washover deposits is shown below. 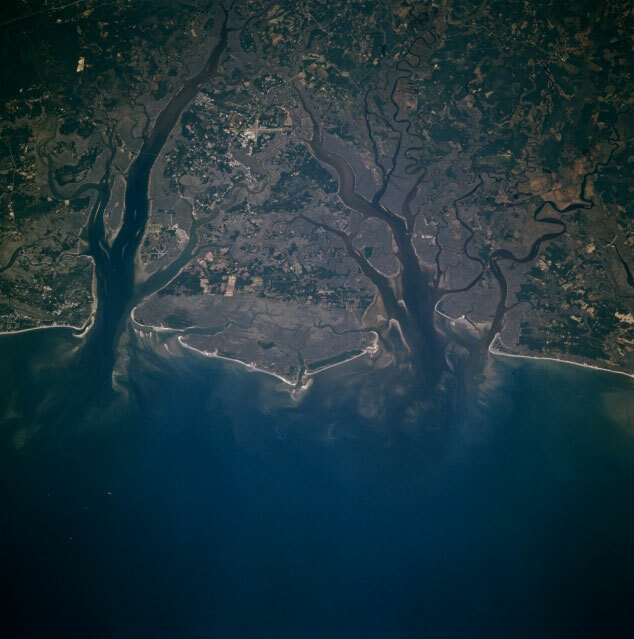 The lagoon of a barrier island system is an area of low energy and allows fine silts and clays to settle out of suspension. 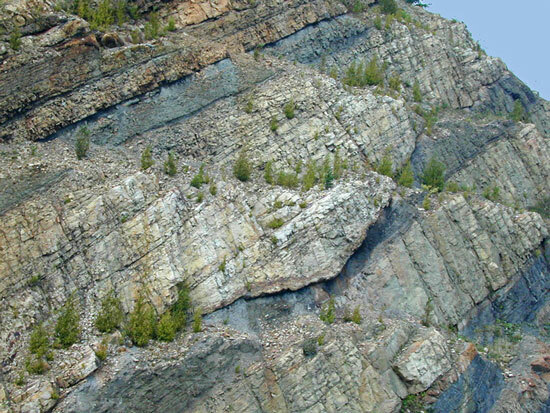 This leads to the formation of mudstone and shale. If, due to restricted flow regime, the lagoons become anoxic organic rich muds will form. Because of the impermeable organic rich mud being interspersed with layers of permeable sand (for stratigraphic models see migration) these lagoonal environments become excellent areas from petroleum storage. Also within the lagoon if saltmarshes are present then there is the possibility of coal formation. Sediment Geometry: In lagoons, sediments are deposited in fine laminar deposits which are close to horizontal. Sediment Record: Lagoons are well preserved in the sediment record as shales and mudstones which are bounded by sands from the dune deposits. Tidal inlets connect the quiet back barrier environments to the open ocean. The occurrence of tidal inlets are related to the tidal heights (see tides below) and longshore transport. Inlet deposits are formed similair the that of a pointbar in a river setting (see figure below). The sediment within the tidal inlets progress from pebble and lag deposits at the bottom of the channel to sands at the top. See figure below. Sediment Geometry: An example of the complex sediment geometry of a tidal channel is shown below. Outcrop of Mississippean barrier island tidal channels on Route 23 Kentucky at Pound Gap.